I am so insanely excited about this manicure words cannot even express! Oh Lord, where do I even start? As usual, I look for most of my inspiration online when I want to try a new design. This was no exception. I opened up Mozilla Firefox, stared at my Google home page for a while and then searched Vera Bradley's website. I clicked the word "collection" and that word eventually led me to this beauty. The inspiration for this design came directly from Vera Bradley's cosmetic bag from her Resort Collection. For this manicure I used Barielle Do Unto Others as the turquoise base. Then I took my nail art brush and started working on the details like the leaves and flowers. 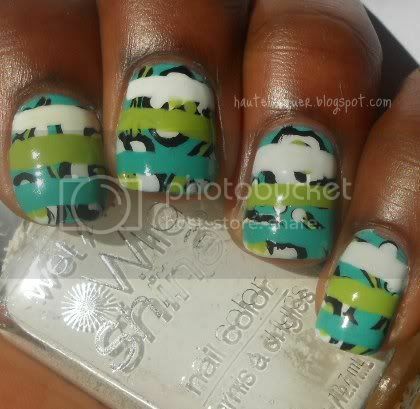 I created each flower (white cream)/leaf (Sally Hansen Green with Envy) and then outlined with black. 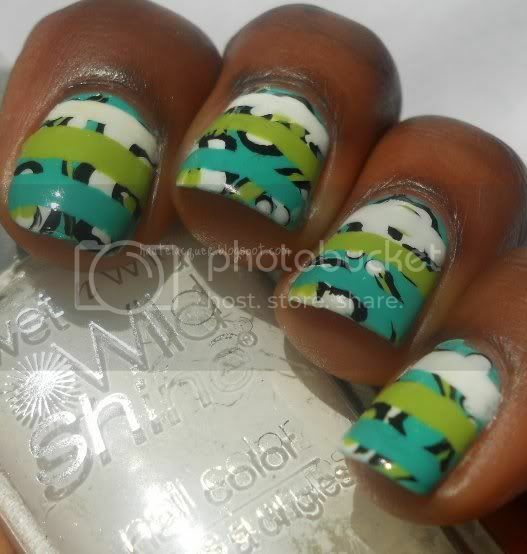 To create the stripes, I used white, SH Green with Envy and Barielle Do Unto Others. I tried to outline the stripes on a couple fingers for more of a contrast but it looks better without the stripes, so I started over. Here's a picture of the bag. The front of it is actually clear with stripes and then the inside and back have the pattern. I just chose to go with the illusion of the stripes being on top of the floral. I might just have to buy the bag, that's how in love I am with the pattern! Where VBrad comes up with these genius patterns? Only the Lord knows. About two weeks ago I started reading the book Invisible Girl by Mary Hanlon Stone and ever since I got it I have been in love with the cover. I really love the colors orange and blue together. I know they say "don't judge a book by it's cover" but...the cover is so pretty. Is it wrong that the cover is one of the main reasons why I got the book? Since I'm pretty much obsessed with the book, I finally decided that I'll use the colors as inspiration for my next design. For this manicure I used a white cream polish as a base. 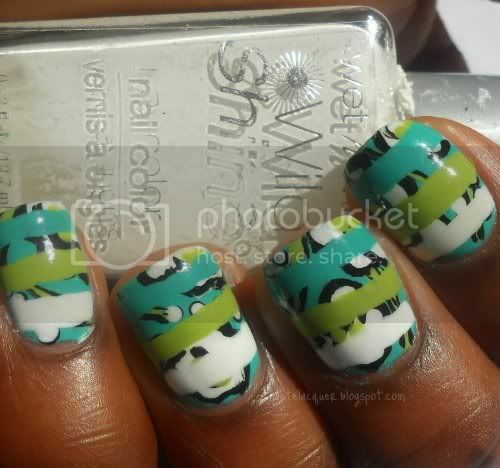 Then I took my nail art brush and Essence What Do U Think? to create the orange slanted French tip. 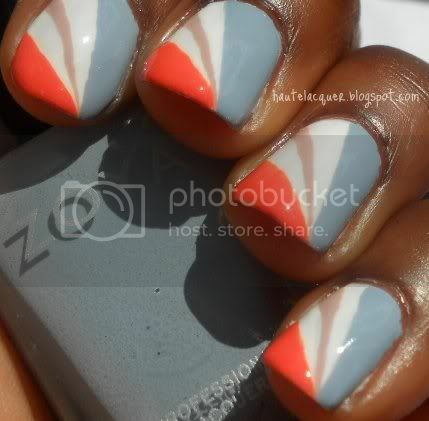 Again, taking my nail art brush, I used Zoya Kristen to create the angled blue stripe that goes across the entire nail and meets up with the orange tip. The last step is optional. I added a beige stripe (Zoya Kennedy) within the white area of my nail to represent the shorts the girl is wearing on the cover. I did all this without tape but you could obviously use tape for sharper, cleaner lines. I personally prefer to freehand since it's quicker and more convenient for me. I'll be back later this week for a very exciting (at least for me) design! I spent almost three hours perfecting it, so I can't wait to share it with you guys! 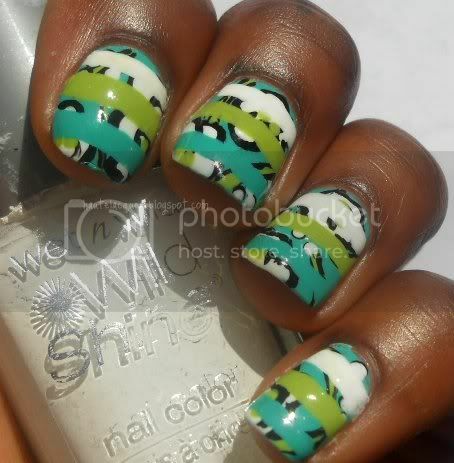 Well I'm back today now that I've found some inspiration for nail art. I'm sure some of you have seen this design floating around Pinterest but for those who haven't I got the idea from Nail Polish Wars. Her blog is amazing so check it out if you're not already following her! 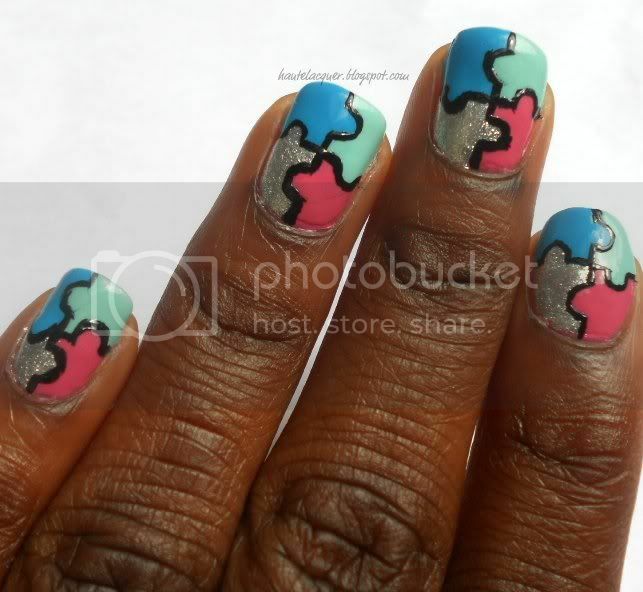 This manicure is just...ugh, it's so brilliant! It's also so simple that I think I'll try different variations in the future. Love this. 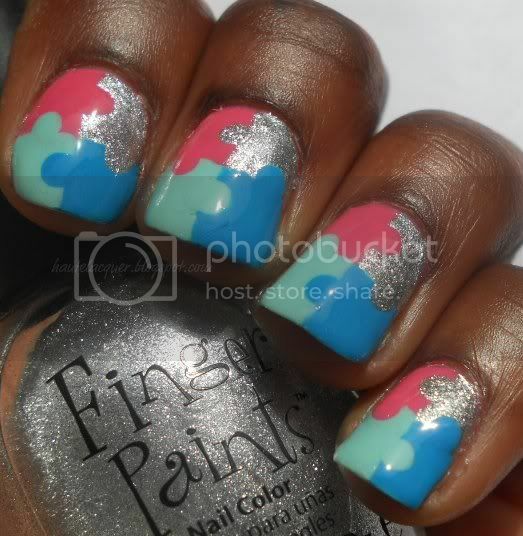 For this manicure I used Fingerpaints Easel Come, Easel Go! as the silver foil base. 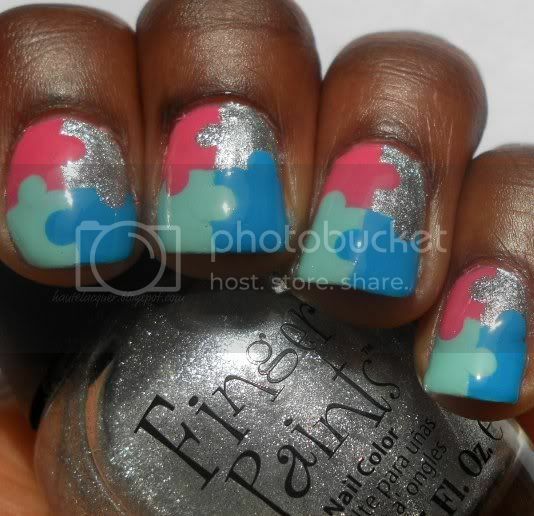 Then, following Nail Polish Wars tutorial (minus the tape, I freehanded), I created each section of the puzzle pieces using the following colors: Zoya Robyn (blue), GOSH Miss Minty (mint green), and Wet N Wild Candylicious (pink). I finished off with a shiny, fast drying top coat. Before I removed this I decided to see what it would look like if it were bordered in black. This was obviously just for fun so it turned out kind of messy, lol. I bet it would look cool with white, or with a design on top. If you ever try it, let me know. I'd love to see it! 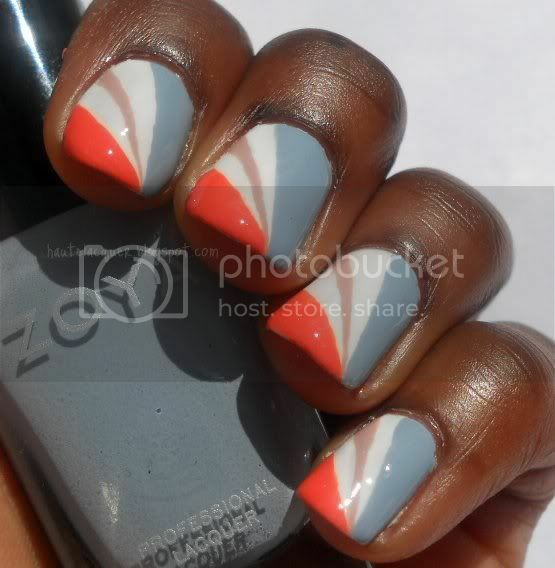 Zoya Beach & Surf Summer 2012 Collections Preview! New nail color - coming soon to a salon near you and Zoya.com! Summer 2012 is going to be a super stylish season for nails with the latest offering of nail polish collections, Beach and Surf, from the new color of fashion, Zoya! This new splash of color, designed by the Zoya color experts, is kissed by sea and sand translating beautifully onto the nail in the famous, full-coverage Zoya formula. Dive into the creamy shades of the Zoya Beach Collection or the shimmering sea foils of the Zoya Surf Collection. The choice is yours – this color palette is sure to be a splash! The Zoya BEACH and SURF collection was designed and inspired by resort runways and tropical get-a-ways. Ultra long-wearing, glossy nail lacquers by Zoya are free of harmful industrial chemicals like toluene, camphor, formaldehyde, resin, dibutyl phthalate (DBP) that are known to cause cancer and birth defects. 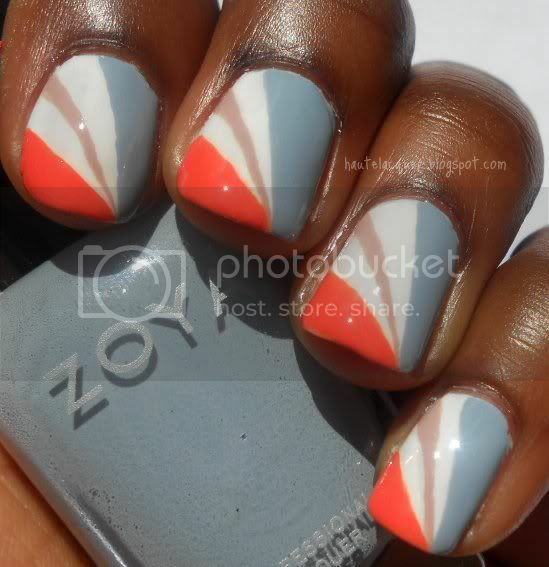 Find Zoya BEACH and SURF as well as over 300 other ultra high-fashion Zoya shades at www.zoya.com. As always, each and every Zoya color is made for women so we name them after women. Sug. Retail $8.00 per 0.5 fl.oz. bottle (US). 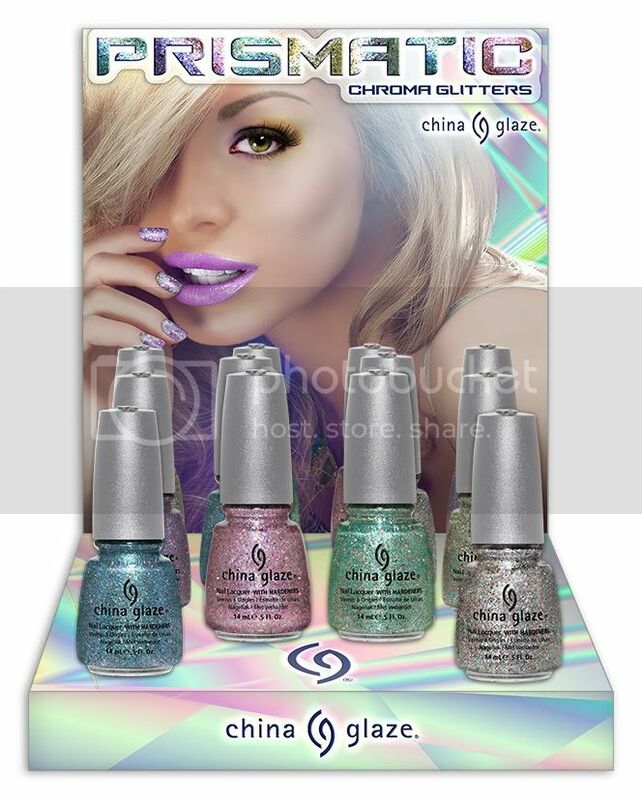 China Glaze Prismatic Chroma Glitters Preview! Array your nails in a myriad of color this spring with China Glaze®’s limited edition Prismatic nail polish collection! Inspired by the colors formed by the refraction of light through a prism, Prismatic by China Glaze® combines glitter and holographic particles to create the ultimate eye-catching, 3-dimensional manicure. China Glaze® Prismatic will be available April 2012. Individual shades retail for $8 MSRP. The collection will be available in a 3-D 12-piece counter display and as open stock colors. 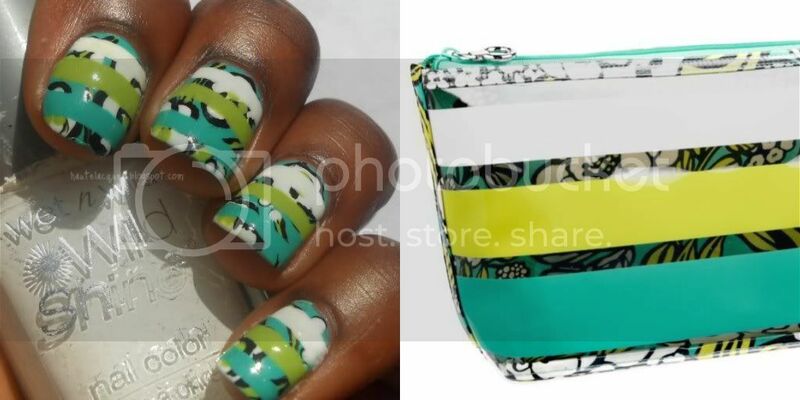 China Glaze is a division of American International Industries. For nearly 40 years, AII has been the leading manufacturer and worldwide distributor of innovative, quality beauty and skin care products for men and women. Our product lines include Ardell, Andrea, Body Drench, Bye Bye Blemish, Checi, China Glaze, Clean + Easy, Clubman/Pinaud, Duo, European Secrets, EzFlow, Fright Night, Gena, GiGi, Gypsy Lash, IBD, Jeris-Lustray, No Tweeze/Micro Tweeze, 'N Rage, Prolinc, RAW, Seche, SuperNail, Surgi-Care, Waterworks, Winning Nails, Woltra, Woody’s, and Youthair. For more information, visit our website: www.aiibeauty.com. ORLY is launching a Pinterest contest today where participants will have until March 19 to create a moodboard or storyboard using images and captions and integrating at least one lacquer from the spring 2012 Cool Romance Collection. Under each pin, participants should use the hashtags #ORLYCoolRomance and #ORLYNails. Finalists will receive a prize bag, including a variety of ORLY products. Romance doesn’t have to be prim and proper. This spring ORLY celebrates edgy elegance with a fresh, fashion-forward take on classic, subdued shades with Cool Romance. a new definition of femininity, with splashes of clean pastels that marry the fresh romanticism of young love with a sleek sensibility that is all grown up. All ORLY Nail Lacquers including the Cool Romance Collection are free of DBP, Toluene and all traces of Formaldehyde and Formaldehyde Resin. Sally Beauty, Ulta and other purveyors of beauty throughout the U.S. and in over 100 countries worldwide. For more information contact LaForce + Stevens or visit us online at www.orlybeauty.com. professionals, ORLY’sbeauty experts have redefined nail care and nail fashion. ORLY’s dynamic color palette includes over 150 Lacquer shades that are completely free of DBP, formaldehyde and toluene. As much a trendsetter as a nail care innovator, ORLY also introduced the first-ever iconic nail look: the Original French Manicure® and reinvented Lacquer application with the award-winning Gripper Cap™. ORLY embodies quality that beauty professionals in over 100 countries worldwide rely upon.